Origin Engines is offering its 8.0L and 10.3 GM industrial engines in propane models. A year ago Origin Engines launched an industrial engine line based on GM's 8.0L and 10.3 L V8 platforms. Today those engines are also available as propane burners, thanks to work with the Propane Education & Research Council. 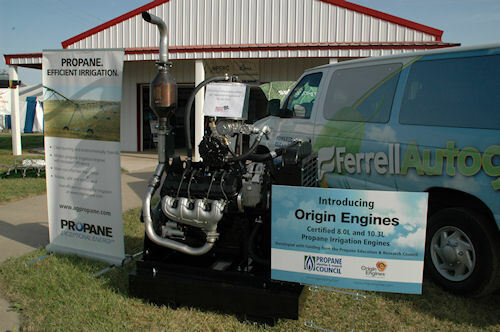 The propane versions of the popular V8s were on display at Husker Harvest Days in Grand Island, Nebraska, this week, and were co-promoted by PERC and Industrial Irrigation of Hastings, Nebraska. The workhorse power plants feature hydraulic roller valve lifters moving Stellite-faced valves seating on hardened valve faces. Hardened valve guides also add to durability over long hours of run time. The reciprocating parts include forged aluminum pistons designed for industrial use, while a specially-ground industrial application hydraulic cam shaft oversees the engine's breathing capacity on natural gas or propane. A forged steel crankshaft runs in race-proven four-bolt mains for steady alignment, and all of the action is sparked by a coil-near-plug ignition system that monitors coolant temperatures and oil pressure, as well as camshaft and crankshaft positions. Both engines meet EPA and CARB emission standards. For more information on Origin Engines, visit www.orginengines.com and to see what PERC can offer you as financial incentives to make a switch to propane-fired industrial power, visit www.agprppane.com/FEED or call (888) 235-4332.